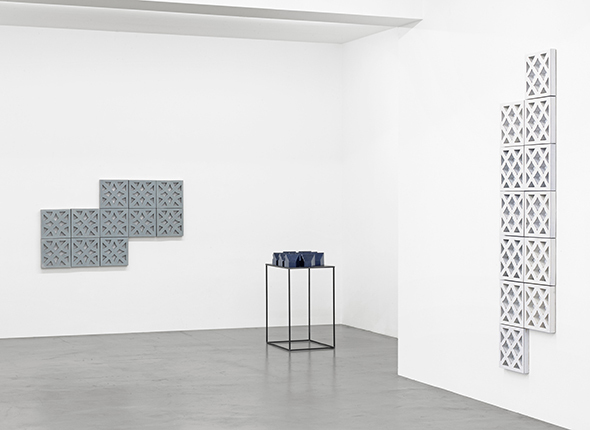 View of Bettina Pousttchi, Ceramics, Buchmann Galerie Berlin, 2016. Photo: Roman März. One of the oldest materials used for sculpture is ceramic, a material which also has a special relationship to the history of Berlin. Large areas of the city were built using ceramic bricks. Like other works by Bettina Pousttchi, the ceramic works presented here reference the field of architecture and its social implications. These murals started out as photographic details Pousttchi took of the patterned blackened oak beams of historic, half-timbered houses and then digitally edited. Similar to a 3D printing technique, the photo file of the façade elements was transformed into a ceramic module. The wall friezes combine the language of European architecture with that of the Middle East. This interlacing of perspectives is based on a transnational vision which is central to the artist’s oeuvre. Bettina Pousttchi was born in 1971 in Mainz and lives in Berlin. In 2014 she received the Wolfsburg Art Prize. Pousttchi has had numerous solo exhibitions, including at the Nasher Sculpture Center in Dallas, the Kunsthalle Basel, the Schirn Kunsthalle Frankfurt, and the Temporäre Kunsthalle Berlin. Taking place simultaneously with the gallery show, and opening on June 9, 2016, the Hirshhorn Museum and Sculpture Garden in Washington, D.C., and the Phillips Collection in Washington, D.C. will also be hosting solo shows of Bettina Pousttchi’s work. The Hirshhorn Museum will be showing from June 9 until January 2017 the first public presentation of the complete 24-part large-format photography series, “World Time Clock,” which the artist spent eight years working on. Since 2006, Bettina Pousttchi has been traveling around the world’s 24 time zones and taking photographs of a significant public clock in each zone; each clock shows the same time. In this cycle, Bettina Pousttchi creates a profound philosophical image of the synchronicity of time. This series also reveals her interest in transnational aspects in a globalised reality. The Phillips Collection will be showing from June 9 until October 2 sculptures from her series “Double Monuments for Flavin and Tatlin” (2009–14). Pousttchi uses constraining materials like crowd barriers—objects found in public spaces—and deforms and stacks them to create sculptural forms that reference the Monument to the Third International by Vladimir Tatlin. Tatlin created his tower, a huge clock, as a memorial for the collective power of the Russian revolution. This is a topic that Dan Flavin also picked up on his “monuments” for V. Tatlin (1964–90). Bettina Pousttchi reflects art historical references and expands on these in her own work by including current social issues. (1) Quoted from: Bettina Pousttchi, The City, Nasher Sculpture Center Dallas and Städtische Galerie Wolfsburg, HatjeCantz, 2015, German/English. The book contains essays by Susanne Pfleger, Jeremy Strick, Thomas Köhler and Adam Szymczyk and a conversation between the artist and Chris Dercon.